Our Customised CD calendar comes from our calendar department here at Calendar Lady Promotions. 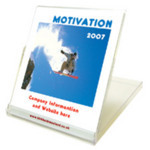 It's a cute CD case style pop-up desk-top calendar which will sit on your desk and advertise your company details and logo. Lots more calendars besides our Customised CD calendar click here. To find out more about our Customised CD calendar click here and fill in the contact form and we'll get straight back to you.